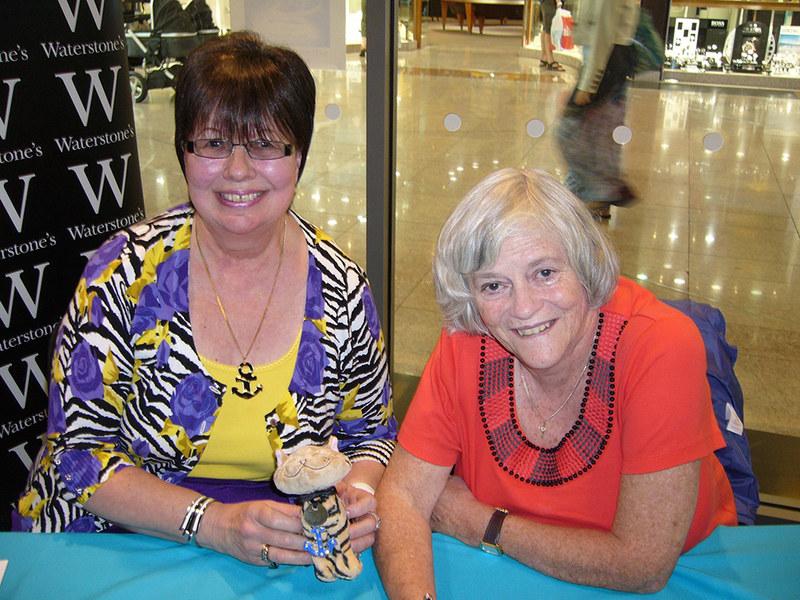 Above: Author Sheila Collins (left) with Ann Widdecombe who wrote the forward for All At Sea With Truffles. Below: The title character is based upon a real cat named Truffles who was the "boss cat" of the various pets that lived with Ms. Collins. (Photos courtesy of Ms. Collins). 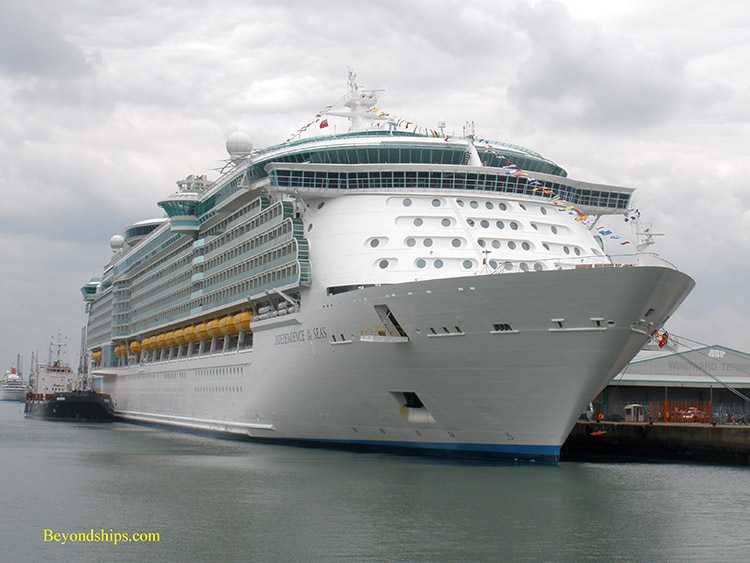 Readers will recognize elements of Celebrity Eclipse (above) and of Independence of the Seas (below) in the descriptions of the ship that Truffles sails upon. Both ships are seen here in Southampton. All At Sea With Truffles is an unusual book. It is the story of a cat who goes to sea. Of course, there have been cats at sea as long as there have been ships but their nautical role has traditionally been mouse-control. The cat in this book simply goes on a cruise. Truffles is a tabby cat who presides over a home in Cornwall in England. When not otherwise engaged in typical cat pursuits, she writes books in diary form about her adventures and observations on life. Ghost-writing for Truffles is Ms. Shelia Collins. Inspired to start writing by the humorous antics she observed of her various pets including five cats, two dogs and a macaw named Geronimo, Ms. Collins has now written four books in the Truffles series as well as several other books. The Truffles diaries have attracted a following, particularly in the United Kingdom. In fact, former British Member of Parliament, novelist and television presenter, Ann Widdecombe was so taken with the first volume that she has written the forwards for each of the subsequent volumes. Ms. Collins is also a veteran cruiser with more than 45 cruises to her credit. She has cruised with several cruise lines including P&O Cruises, Princess Cruises and Costa Cruises but her favorites are Celebrity Cruises and Royal Caribbean International. Although she prefers to cruise out of Southampton, England, she has also sailed from Fort Lauderdale, Miami, San Francisco, Barcelona, San Juan, Venice and other ports. In short, Ms. Collins knows something about cruising. Consequently, it is not surprising that Ms. Collins decided to take her successful Truffles character to sea. The result was this the fourth volume in the Truffles series. The story takes place during a Mediterranean cruise from Southampton. It is a typical cruise, no pirate attacks or encounters with icebergs or rogue waves. The fictional ship - - a composite clearly drawn from Celebrity Eclipse and Independence of the Seas - - merely departs Southampton, goes to sea, visits a few ports and returns home as usual. What takes this cruise out of the ordinary is the presence of Truffles onboard. Except for service dogs, animals are not usually permitted on cruise ships. Guests may bring pets onto Queen Mary 2 but even there the pets stay in the kennels and do not mix with the passengers. 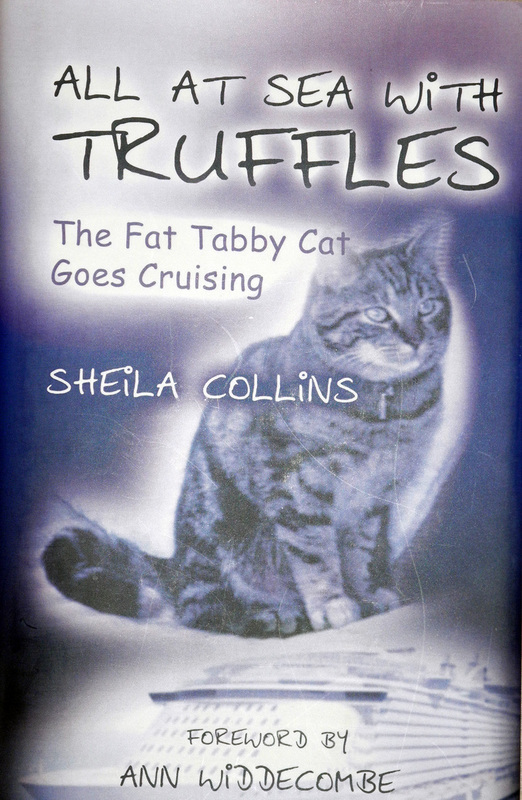 In this book, however, the fictional cruise line has given special permission for Truffles to come aboard and mix with the guests. Although not explicitly stated, the reason for this special dispensation appears to be that Truffles is a noted author. Because cruising is not something that cats normally do, we get to see the cruise from a different perspective. Ms. Collins has imaginatively thought through what it would be like for a cat to encounter the typical events that occur during a cruise from packing for the cruise to check-in and on through to disembarkation. Truffles' observations can be broadly divided into two categories. First, we have feline-oriented observations. For example, since cat's do not care to be in water, Truffles is skeptical of being surrounded by the sea. On the other hand, she views the ship's rock climbing wall as great fun. When crew members clean the cabin window by spraying a hose on it, it sends Truffles racing up the curtain. But the room steward with a shrimp gets his ankles rubbed. The second category is her observations as to the behavior of the humans aboard the ship. She is somewhat perplexed by the noisy casino and by her human caretaker's addiction to shopping for handbags. Similarly, she does not understand the human's need for so many outfits when one fur coat is all she needs. While she finds such things odd, she simply tolerates them as part of an enjoyable way of life. What makes this latter category of observations particularly interesting is what they say about human nature. If written from the perspective of one human looking at another, they might seem critical. However, written from a cat's perspective, you just nod “yes, there is some truth in that” and smile. All At Sea With Truffles is written in a charming style. This is the type of book that enchants. You can put it down and return to it later and quickly become wrapped up in its spell once more. You do not need to be a cat lover to enjoy this book. Indeed, I would have to confess to being much more partial to dogs. Nonetheless, I found Truffles to be a delightful companion. Along the same lines, you do not have to be a veteran cruiser to like this book. After all, the premise of the book is that this is Truffles' first cruise. However, even experienced cruisers will benefit from Truffles' insights. All At Sea With Truffles is published by Apex Publishing Ltd. It is available directly from them or through the major online book retailers.